The illustrations are absolutely gorgeous. Moon glow lights the back of a cat, and turns the backyard a soft green. Though it’s a grey foggy night with a dark blue sky, there’s a warm yellow light coming from the open back door. It’s the house where “Elizabeth and Sarah lived,” and on a cold night, a stray cat walks out of the woods and up their steps. Charlie Anderson is one of those children’s stories with enough warmth to touch readers of all ages. The cat “curled up next to their fireplace to get warm,” then tasted their dinner and tested their beds. With a perfect watercolor illustration for each action, the book makes the cat seems real. Every morning he disappears into the woods – but at night while he sleeps on her bed, Elizabeth can hear the cat purring in the dark. One drawing shows the girls making a soft bed for the cat in their suitcase. They don’t want to leave him behind when they visit “their father and stepmother.” Abercrombie manages to suggest so much with these single-page moments. One stormy night, Charlie didn’t come to visit, and the girls sat on their steps in raincoats calling the cat’s name. It’s a classic picture-with-stories, since the children’s faces say just as much as the story’s text. Elizabeth looks sad and distracted, while the rest of drawing shows her bedroom window filled with the dark night outside. “All night long Elizabeth listened to the rain beating on the roof and the wind rattling the windows.” And the next day, when their neighbor offers them cookies to cheer her up, the little girls turn them down. The book has a twist at the end – and it’s a very funny surprise. The children ask a neighbor if he’s seen their gray cat, while the man says he has a gray cat of his own. Charlie comes strolling down the stairs, and purrs at his owner – and at the two girls. The man assumed that his cat was hunting at night, when he was really just sleeping in the girls’ warm house. 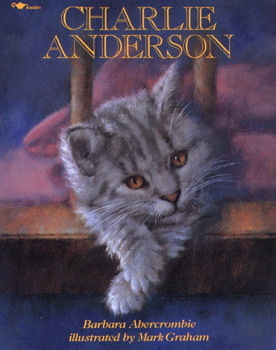 On the last page, the author tucks her message – that the cat has “two families who love him,” just like the girls do with their now-divorced parents.